This particular artifact has “Modern” written all over it. In a lot of people’s minds, that format is associated with cards that break rules and norms like “lands produce one mana” and “the number of spells cast in one turn doesn’t have a bearing on whether you’re going to lose right this minute”. It’s not a straight replacement for Blood Moon, as it doesn’t have an effect on three-color decks the way the Moon does, but it’s notable that any deck can use it, and that it is an artifact for the purposes of cards like Myr Enforcer and Time Sieve. I know Modern isn’t the only format with multi-mana lands, but I find it hard to imagine a card like this being very necessary in casual play. I mean, are you really losing that hard to Watermarket? 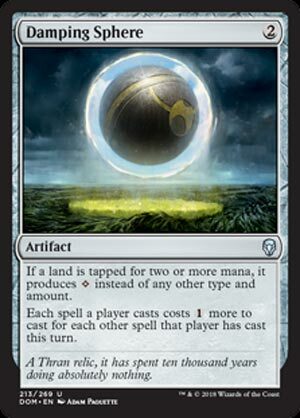 Damping Sphere is one of those cards that’s playability will vastly differ depending on your play group. This is one of those cards that was created strictly with modern in mind. The most notable decks this card counters is Eldrazitron, Affinity, and Storm. Since Damping Sphere is colorless its practically begging to be added to any Modern sideboard. Damping Sphere is one of Dominaria’s best cards, but it still has very narrow appeal. Damping Sphere is a card whose value lies in neither Standard nor in Limited, but in Modern and potentially the likes of Legacy and Vintage. It’s a potent hoser card for decks that have degenerate mana bases (like Tron and Eldrazi…and Eldrazi Tron) and for decks that aim to vomit large amount of cards in a short window, such as Affinity and Storm. This is a sideboard card through and through, but it’s a nifty hate card in that, when it works, you’ll notice it working.